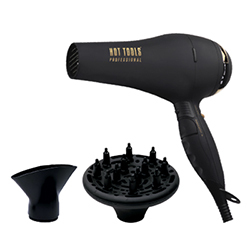 This sleek, soft touch finish Black Gold Dryer features direct ion technology for frizz free styling, Black Gold Ion Select for adjustable ionic output to control hair volume and increase shine for any hair type/texture, and power boost for increased airflow velocity. Multiple heat/speed settings, cool shot button, removable lint filter, and 9 ft. professional cord. Lightweight, only weighing 14.4 oz. Includes concentrator and diffuser attachments. Lifetime warranty.